Save $10 on a 90 Day Supply of PowerThin Phase II and receive a free book (valued at $19.95)+ free shipping (valued at $6.95) from PowerThin. 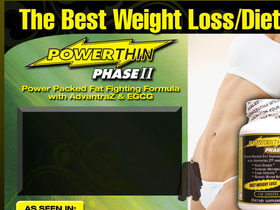 Purchase a 60 Day Supply of PowerThin Phase II and save $5 plus receive a free gift (valued at $19.95) from PowerThin. Purchase a 60 caplet tester bottle of PowerThin Phase II from PowerThin.com and receive a free report (valued at $19.95). Click link for details. Try it, you have absolutely nothing to lose but the weight. Click link for details.